Today on the agenda was lunch with some girls I used to work with. Amazing, beautiful, funny ladies. "Where are we meeting for lunch?" "We're going to meet at Looney's in Maple Lawn." "Where the hell is that?" "From the name 'Looney's' I am going to guess it is causal. Am I correct in that assumption?" "Yeah. It's a weird area. Imagine if there was a show about the zombie invasion. It's all nice places with no people. No cars. Potential undead." "Oh. Okay. I'll wear jeans then. Something warm that I can run in if chased." 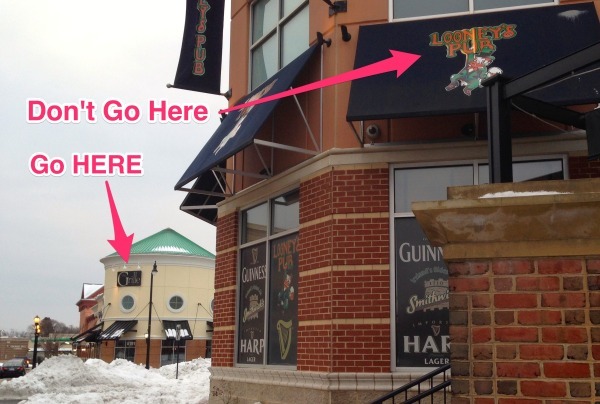 So we went to Looney's and it was what one might have expected. A large cavernous environment with 400 televisions and multiple "bro-gatherings" lining the bars. I had a half of a very large tasteless cheese steak. I swear it said it came with cheese. Cheese would have helped the mulched steak bits on the bun presented to me. Would have at least kept it clumped. But you can't really send your meal back for dairy adhesive. Our one friend left post-cheese steak and then it was just Casey and I. Not having much else planned to to for the afternoon we decided to window shop the zombie village. There were yogurt shops (nobody in there) and coffee shoppes (no one in there) and an over the top lingerie boutique called "Bra-la-la." It was completely out of place and kind of humorous. We gossiped outside their window staring at uncomfortable looking bras until the cold got to us and I suggested we go indoors ANYWHERE before the sleet did what zombies could not. We located a corner spot called the 'The Grille at Maple Lawn.' We walked in and found ourselves to be the only patrons. Normally I would be excited that we were there at the beginning of the afternoon service and would have space and quiet time to chat. But I was with Casey. Casey and I have historically been blamed for something like 18 deaths just for sitting at the same table. There is something chemical that happens when we are left alone together. Others have mentioned it repeatedly. We could sink a cruise ship. Cops have been called. So I chuckled a little when we walked into the opening afternoon service of this unsuspecting establishment. 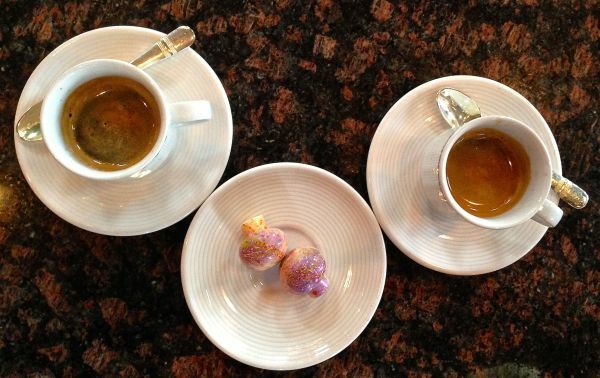 We spoke with the owner (who was painfully attractive). The two barmen. The two other couples that eventually arrived after us. We drank white wine. Every time Casey went to the ladies room I would calmly explain to the other patrons at the wonderfully round bar that I had happened upon my friend on the ride over. Found her walking on the side of the road talking about not liking the hospital she had just come from. They smiled and laughed nervously. I find that stories delivered in a somber regretful tones result in higher levels of audience uneasiness. Casey would then return from the bathroom speaking loudly and energetically about the available hand soaps and wall textures. 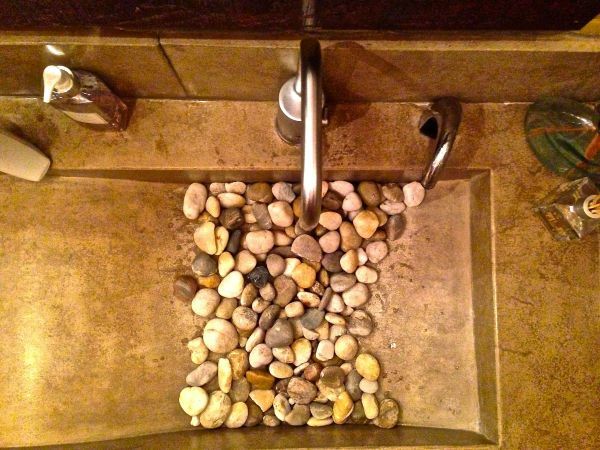 "They have real STONES in the sink." Honestly anything she would have said would make them more fearful. So, it's fun to watch. There actually were real stones in the bathroom sink. Yeah, that excited me, too. This is the wall in the bathroom. I stood and felt it with my hands for an awkwardly long time.Casey fell in love with the bartender. His name was Mariano. He said it quickly and with a heavy accent so each time he reminded of us of his name was Casey and I would lean in towards him and slowly repeat "Mah-jih-aaanos." Got it. We are white people. But we try, god love us. Mariano was awesome. Besides being an engaging and proficient bartender he was incredibly patient with our need to involve the entire establishment in our conversation. He loved dogs. That helped. His dog was somewhere around the order of 116 times larger than Casey's animal and should have been considered another species. He was a true lover of Neopolitain Mastiffs. In fact he was a breeder-owner. Proof point on his dedication was that while talking about last week's Westminster Dog show he mentioned that he had gone. He went there. Was there. Went to New York City in the middle of the snow storm to see other peoples dogs. 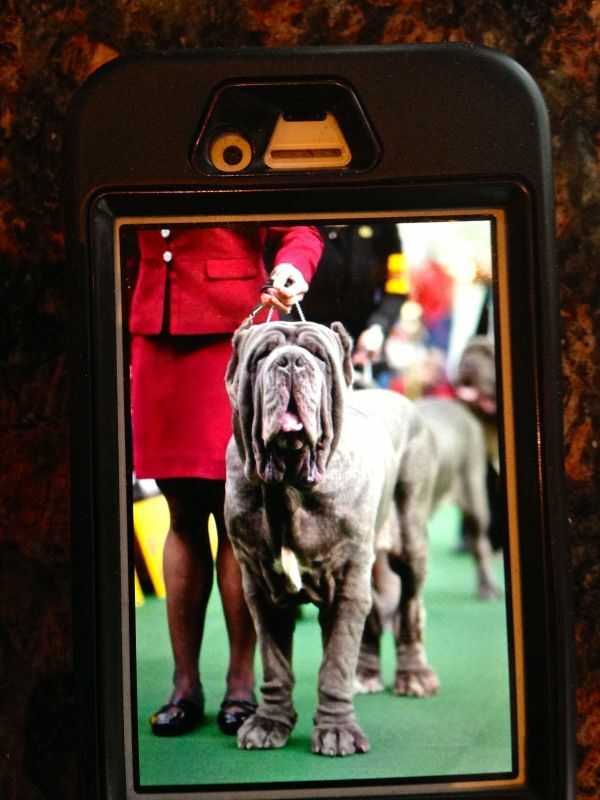 Here is a photo off of his phone of a dog from his dogs breed line. This gorgeous animals name is Paparazzi... or 'Papi' for short. At one point he had 6 of these horses living in his home. Wha? He's in deep, man. Deep. Trippy, no? It was a white passion fruit chocolate. Can you be-lieve how fricking fancy we are? Right?I was really happily surprised by this place overall. It had a ton of attention to detail. The owner really, genuinely cared about the food he was serving. Hell, they had "Paella for Two" as an entree. Who mkes paella anymore? The place had giant curtains that were straight out of either Beauty and the Beast or some high style Vegas place. I like Big curtains. I like things that make me feel small. This is how they made the booze look pretty. Pretty matters to me. They have a chocolatier. And a macaroonatier. I made that last one up. I don't know who makes macaroons. Not me, surely. 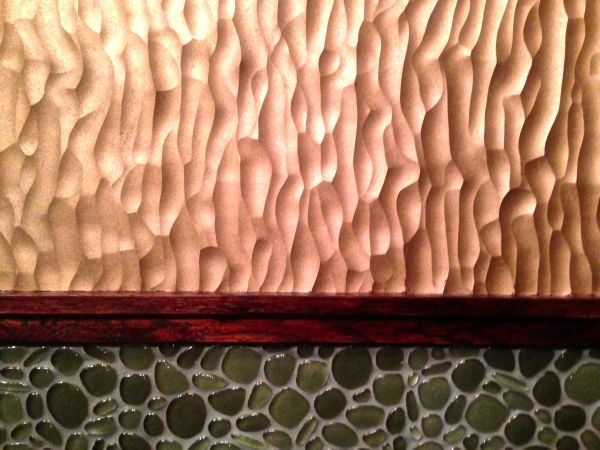 I could lie and say this was a picture of a dozen things... but it's another picture of the bathroom wall. It's not the best reason to go to this Restaurant - but it is a damn good second reason.So it was a lovely unexpected afternoon. At a lovely unexpected place. It did not burn down simply because Casey and I were together (see!) And I will be going back there for that Paella, damnit. I didn't see one zombie. Go check them out and tell me what you order.